Welcome to the official website of The Maine Troop Greeters & Museum of Bangor, Maine. We are a non-profit group of veterans and men and women supporting our armed forces serving overseas by greeting troops who arrive at Bangor International Airport. Day or night, rain or shine, it is our commitment to welcome each troop home from war and give a proper send off to each of the young men and women heading overseas. We accomplish this by being here to offer free cell phones to call a loved one, a snack to keep them going, and handshakes to let them know we care. Since we began greeting flights in May of 2003, the Maine Troop Greeters & Museum have greeted more than 7,767 flights with more than 1,564,572 service members and 409 military dogs. And it is our pledge that as long as there are U.S. Armed Forces serving overseas we will be here to greet them. For Troop Greeters Only: If you have not had a chance to purchase your T-Shirt, please note that T-shirt orders will continue to be taken and ordered once the quota of 12 shirts is reached. Please place your order with the person in the Troop Greeter room. You may also contact Allison Hernandez or Cathy Czarnecki to place an order. Shirts are $12 for sizes S-XL and $15 for XXL and up. These shirts will be made available to troop greeters only and will need to be prepaid. The Maine Troop Greeters & Museum Organization is a 501c3 organization and as such welcomes any monetary donations. 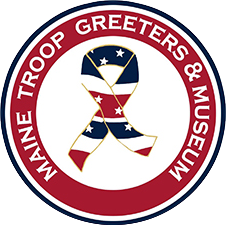 Your kind donations may be used to uphold the Maine Troop Greeter mission of providing for our troops when they transit through Bangor International Airport and will be used to ensure the Maine Troop Greeters Museum Endowment Fund Campaign is successful. Please select the Pay Pal account of your choice below. The mission of the Maine Troop Greeters & Museum is to express the nation’s gratitude and appreciation to the troops, for those going overseas for a safe return and for those returning for a joyful homecoming and to make their (hopefully brief) stay in Bangor as comfortable and pleasant as possible. Additionally we will honor the trust placed in us by these troops by preserving and perpetuating the donations entrusted to our care, through display, education and sharing of these collections.